style is appropriate to the historiography of the subject. The essays in Part II consider a number of case-histories. They present important revisionist scholarship and original contributions on topics drawn from ancient, early modern and more recent philosophy. All the essays have been specially commissioned, and the contributors include many of the leading figures in the field. The volume as a whole will be of vital interest to everyone concerned with the study of philosophy and of its history. philosophy, Rorty came to doubt its foundations. This doubt prodded him to master American pragmatism as well as continental European work in hermeneutics and deconstruction. This work, in turn, led Rorty to question the entire tradition of Western philosophy. These doubts are expressed in his second book, Philosophy and the Mirror of Nature (1979), which is one of the most widely discussed of all recent American works in philosophy. It announces the death of philosophy as a kind of higher knowledge but recommends its continuance as edification and as a branch of literature. Choice proved prophetic in stating that "this bold and provocative book is bound to rank among the most important of the decade." J. B. Schneewindis a professor of philosophy at Johns Hopkins University. He is the author ofSidgwick’s Ethics and Victorian Moral PhilosophyandThe Invention of Autonomy. 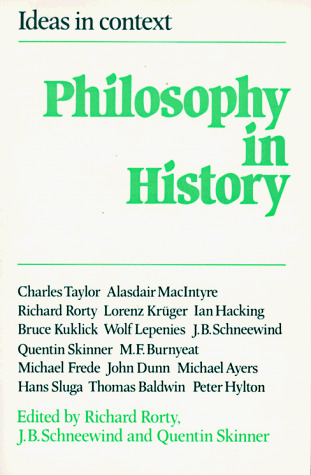 Why do we study the history of philosophy?